Doggy Day Care Farm Trips are good for all breeds, and are especially popular with owners of dogs living in city apartments. It really is the best dog day care in Sydney! There’s limited seats on the doggy bus available everyday so be quick and book your Farm Trip today. 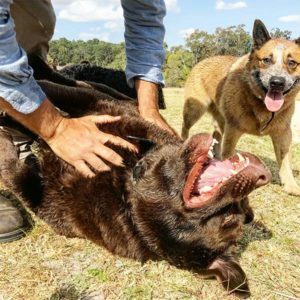 There is no other dog day care and boarding servicing Sydney quite like it. We guarantee every dog will get lots of exercise and stimulation. There’s lots of new experiences, games and activities, plus new farm smells. They’ll also get lots of friendly, positive socialisation while having truckloads of fun! Doggy Day Care Farm Trips are great for dogs of all sizes. Book your trip today! Is doggy day care good for my dog? Every dog is different and sometimes dogs just want to be dogs and hang with other dogs. That’s why we created The Farm. This article from fern dog training is a great way to help understand our furry friends.